This package was approved by moderator gep13 on 3/23/2019. T-Clock Redux is an enhanced fork of Stoic Joker's T-Clock 2010 with ISO week number support, bug fixes and the ability to use Windows' default calendar and tooltips. T-Clock (called TClock), originally written by Kazubon in the early 90's, was a popular classic that was on the edge of extinction when Windows started going 64bit. ... Stoic Joker simply chose not to let that happen. And now it's up to us to continue their efforts. 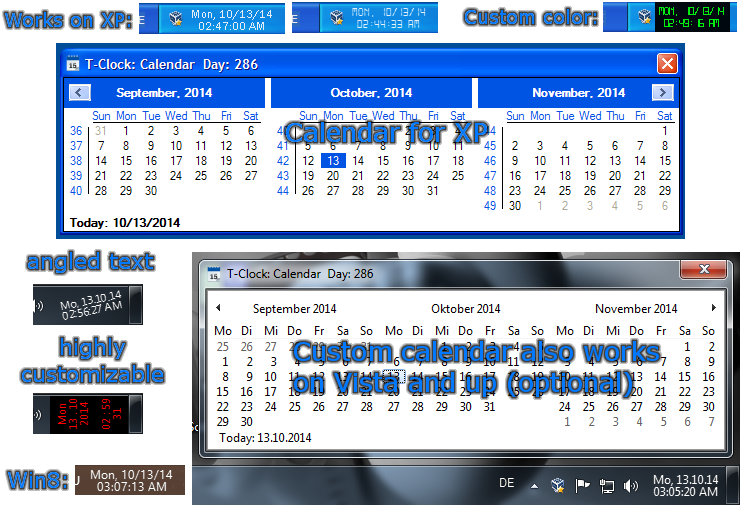 T-Clock will allow you to "Use small taskbar buttons" and display both time and date. Once installed, enter clock or clock64 in the "Search" or "Run..." fields of the Start menu or in a "Command" window. Options are then available by right-clicking on the clock. Destination  = Join-Path $env:ChocolateyPackageFolder "v$env:ChocolateyPackageVersion"
This discussion is only about T-Clock Redux (portable) and the T-Clock Redux (portable) package. If you have feedback for Chocolatey, please contact the google group. Tell us what you love about the package or T-Clock Redux (portable), or tell us what needs improvement. Deployed from e27d7a207f. You are on web.3. UTC time is currently 22 Apr 2019 19:09:00 +00:00.